Barton Community College employs a registered nurse full-time for the fall and spring semesters in an academic school year. Basic services are free to all students and employees of the college. *Please note: all expenses incurred through medical, dental and eye referrals are the responsibility of the student, parent or guardian. The mission of the College Health Program is to help maintain a state of optimum health, both physical and emotional, among the students, faculty and staff. Prescription injections can be given with approval of prescribing physician and college nurse. Medication must be provided by the student. The college does not have a plan or endorse any particular plan. Information on medical insurance policies provided through private agencies is available at the Student Health Office. In compliance with Kansas Statue KSA 2009 Supp. 65-129, the college has instituted a tuberculosis prevention and control policy for students. STDcheck.com is leading online STD testing provider now offering free HIV testing to Barton students. Testing is completely private and nothing goes on your medical record. 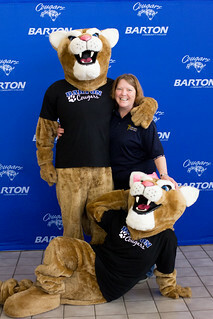 *Please note: on the web site where is says to use an .EDU email, students must use their bartoncougars.org email address. Tues. from 8 a.m. to 5:30 p.m.
Fri. from 8 a.m. to 1 p.m.